A bedside sleeper or cosleeping bassinet is one way to keep your baby close to you at night. Current safe sleep recommendations tell us to keep babies in the same room as parents for the first 6 months in order to reduce the risk of SIDS. But while your baby is supposed to be in the same room, safe sleep organizations do not recommend letting baby sleep in the same bed as parents.That's where the bedside sleeper or cosleeping bassinet become interesting options for new parents. These products are designed to allow baby to sleep right beside the parents' bed, or even in it, while still maintaining a separate sleep space for baby. A bedside sleeper is a bassinet that is made to be attached to the side of the adult bed. Usually, one side is lower than the others to allow parents easy access to the baby at night. The lower side may form a short barrier between the two sleep spaces, or it may be adjustable so that the two sleep spaces meet at the same level. Mandatory U.S. federal safety standards for bedside sleepers went into effect in 2014. Some bedside sleepers have been recalled because they allowed a baby to fall in a gap between the two mattresses, or otherwise allowed entrapment or strangulation. Any bedside sleeper sold in the U.S. must now meet the appropriate safety standards. If you're considering buying a used bedside sleeper, though, older models may not be safe enough. Play yards that are designed to function as a bedside sleeper are also required to meet these federal standards as of 2014. The American Academy of Pediatrics does not list bedside sleepers among their suggestions for safe sleep spaces for baby. Health Canada includes a specific warning in their safe sleep recommendations — "Co-sleeper products are not recommended by Health Canada. These products present a risk of suffocation and entrapment. Instead use a crib or cradle next to your bed." If you choose to use a bedside sleeper, you should carefully check the mechanism that holds the sleeper next to the adult bed. Will it slide away and allow a gap to form? You should also check the mattress supports to be sure they are sturdy and won't allow the mattress to sag or dip. Check the weight limits and look at any age recommendations given by the manufacturer. Once your baby is able to roll over, sit up, or crawl, it will no longer be safe to use the bedside sleeper. Babies can learn some of these skills at 3 or 4 months old, so take that into account when deciding how much to spend on a bedside sleeper. A product many parents love for keeping baby right by the bed is the Halo Bassinest — a portable, bed-height bassinet that can be swiveled into several positions for access to baby. Other bassinets may also fit nicely into the parent's bedroom, or some parents may choose to use their baby's play yard next to the bed instead of buying a separate bedside sleeper. The mattress for your bedside sleeper should be firm and should fit in the sleeper without any gaps at the edges. The height should be adjustable somehow so that you can make the surface level with your own bed. The mattress should either have a waterproof cover, or it should be able to be cleaned in another way. There are no size standards for bedside sleepers as there are for full-size cribs. That means you can't just buy any old sheet and expect it to fit the way crib bedding does. All bedding must fit properly so it doesn't form pockets or bulges that could obstruct baby's breathing. It's a good idea to have an extra sheet on hand in case baby spits up or has a diaper accident at night. Don't add any soft bedding to your baby's sleep space. This includes quilts, bumper pads, and pillows. Do not try to make the mattress softer by adding foam or blankets. A bare, firm sleep space is best for baby. Since your bedside sleeper might only be useful for a few months as a sleep spot, look for sleepers that have other functions, as well. Some can become a play yard or a deeper bassinet that can be used a little longer once the baby is rolling around. It's also nice to choose a bedside sleeper that can be folded easily for travel. A cosleeping bassinet lays on top of your bed, providing a small, walled-off space for your baby to sleep. There are several different types of cosleeping bassinets, and most are not covered by a federal safety standard because they don't really fit into a broad product category. As with bedside sleepers, cosleeping bassinets are not included in the AAP safe sleep guidelines, and Health Canada specifically warns parents against using them. If you choose to use a cosleeping bassinet, make sure it provides a firm surface for baby to sleep. The mattress portion should fit snugly inside, with no gaps. The sides should not be padded. Look for mesh sides or other breathable materials. Make sure the frame cannot be easily collapsed if a parent rolls against the edge of it, as this could entrap your baby or cause injury. 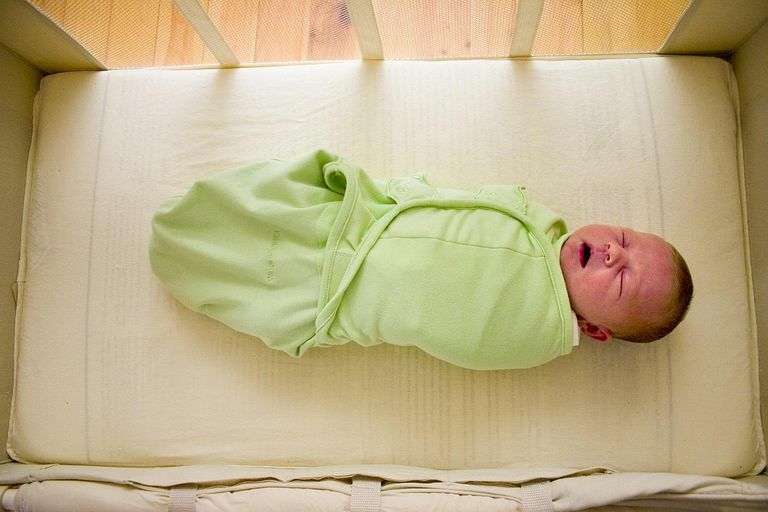 Again, once your baby can roll or sit up, you'll need to stop using the cosleeping bassinet. Create Your Own Bedside Sleeper? There are lots of instructions available online for making a bedside sleeper or sidecar sleeper out of a crib or some other furniture. It's not a good idea to take chances with your baby's sleep space, though. An improperly anchored crib next to your bed could slip and form a gap where the baby could become entrapped. Other misused items could create an entanglement or strangulation hazard. Always buy cribs, bedside sleepers, play yards, and other sleep space items that meet the appropriate federal safety standards.